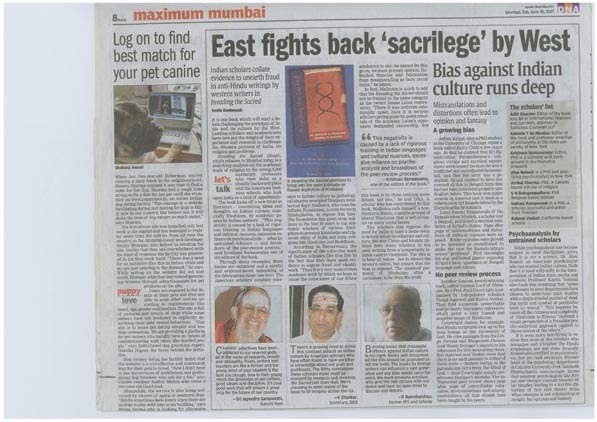 It is one book which will start a debate challenging the portrayal of India and its culture by the West. Leading scholars and academicians have now put the weight of their experience and research to challenge the Western pictures of India, its religion and problems. 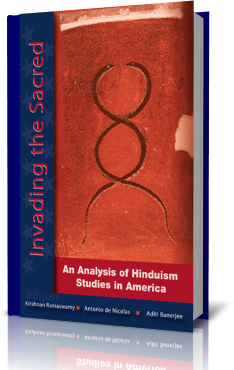 Invading the Sacred (Rupa), which releases in Mumbai today, is a searching analysis on the academic study of religion by the strong 8,000 university professors who view India as a chaotic backward place and the American business schools who look upon India as a land of opportunity. The book kicks off a new trend in literature – countering ideas and thoughts on Indian culture, especially Hinduism, by academic papers by Indian authors. “This negativity is caused by a lack of rigorous training in Indian languages and cultural nuances, excessive reliance on psychoanalysis — often by untrained scholars — and breakdown of the peer-review process,” said Krishnan Ramaswamy, one of the editors of the book. Through many examples, these biases are examined and a careful and evidence-based debunking of the fabrications made (see box). The American scholars’ constant reference to Indian culture as pathological abusive prompted Diaspora intellectual Rajiv Malhotra, who runs the Infinity Foundation, to coin the term Hinduphobia, to expose this bias. The Foundation has given away millions in the last 10 years to top academic scholars of various disciplines to promote knowledge and rigorous study of India and Indic religions like Hinduism and Buddhism. According to Ramaswamy, the significance of the collective work of Indian scholars like this lies in the fact that they have used evidence to expose fraud and shoddy work. “Thus it is a very mainstream academic work by which we hope to rouse the conscience of our fellow academics to say: we cannot let this go on, we must prevent opinion, far-fetched theories and fabrication from masquerading as facts about India,” he added. In fact, Malhotra is quick to add that the Invading the Sacred should not be framed in the same category as the recent James Laine controversy. “There it was activists emotionally upset; here it is serious scholars giving point-by-point rebuttals of the academy. Laine’s opponents demanded censorship, but this book is by those seeking more debate, not less,” he told DNA. A scholar who has contributed to this book, Malhotra calls himself a non-Hindutva Hindu, a middle ground of liberal Hinduism that is left-of-centre on many social issues. The scholars also express the need for India to have a home team to debate about its religions and culture, the way China and Islamic nations have many scholars in the west writing from a sympathetic Islamic-centric viewpoint. The idea is to hear all voices – not to silence the western voices, but ensure that the bias is exposed. The standard portrayal of Hinduism, often a caricature, is far from the truth.